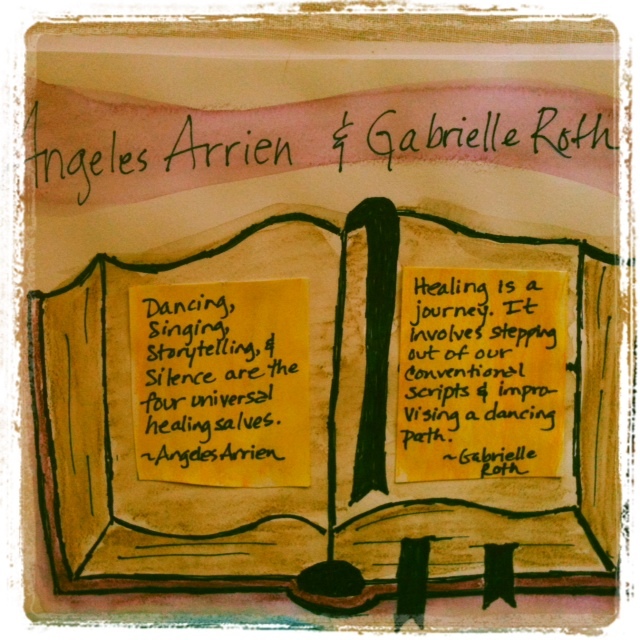 This entry was posted on May 15, 2013, in Cultivating Creativity, Self Discovery and tagged Angeles Arrien, anxiety, art journal, control, dancing, Gabrielle Roth, indigenous wisdom, silence, singing, storytelling, the four healing salves, worry. Bookmark the permalink. This is a story about worry. And it just happens to feature two amazing women, Angeles Arrien and Gabrielle Roth. 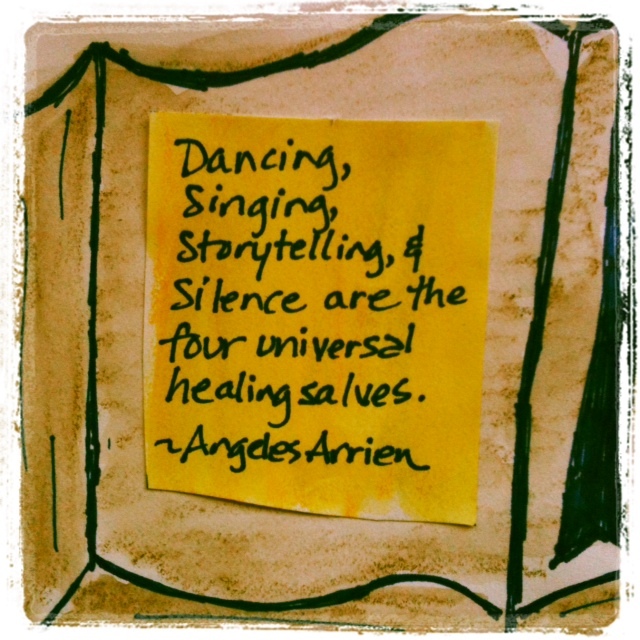 Here’s how it goes: several years ago I was reading a book and came across an interview with Angeles Arrien where she talked about the four healing salves: singing, dancing, storytelling and silence. 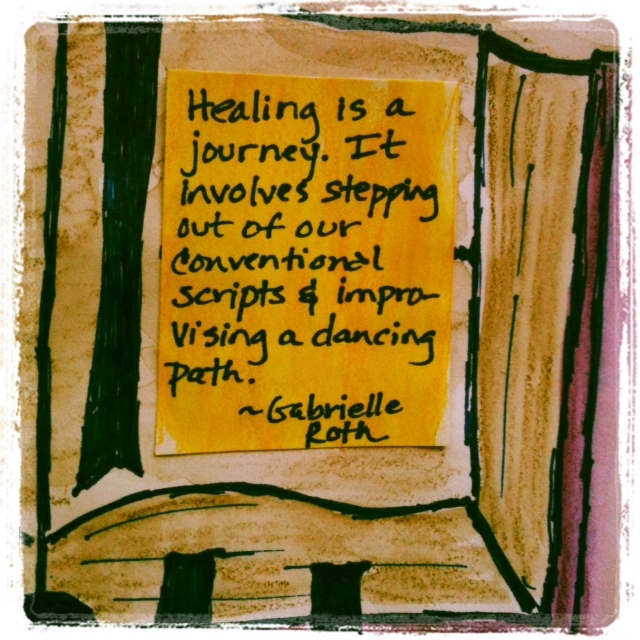 Her words resonated with me so much and inspired me to write a post about healing. And, no surprise, this powerful quote stayed with me, taking up residence in my heart and soul. Then, a few months ago, I noticed the quote making its way around the internet, showing up on websites and blogs. 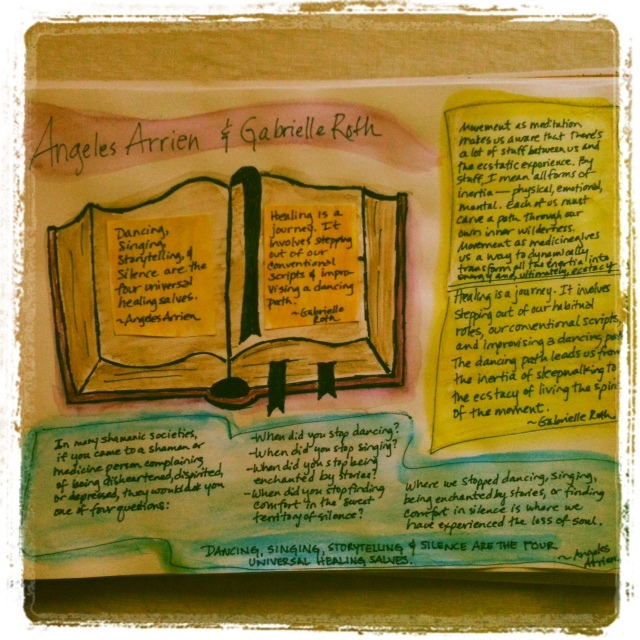 But here’s the thing: the quote was attributed to Gabrielle Roth, not Angeles Arrien. That really confused me, because I was so sure I knew who’d said it. So I did a bit of sleuthing, and mystery solved. Turns out Angeles Arrien wrote the preface for one of Gabrielle Roth’s books, and that’s how it got linked to her name. For some reason I thought others would discover this too, so no big deal. But I kept seeing it and well, it worried me. Strange, isn’t it, that something like this would worry me? But I worried that the people using the quote didn’t know who said it and would want the information. I also worried for Angeles Arrien, thinking that she’d feel discouraged or frustrated. I even left a comment on someone’s blog letting them know the true origin of the words. And almost as soon as I hit submit I realized that this was far beyond my control. No way could I police the big, wide internet, acting as defender of Angeles Arrien’s words! Nor would I want to. And I’m pretty sure Angeles Arrien doesn’t need me to play that role in her life. But that’s how we spin into worry, you know? We lose sight of what we actually have control over. We forget how to relinquish the psuedo-control we think we have. Often, when my clients are immersed in worry, I ask: What do you actually have control of here? This time, I had to ask myself the same question. And here’s what I came up with: I could create an art journal page to honor the wise words of both women and share it with you here. And then I could put my worries aside and remember what truly matters. So here you go, in her own words. Sign up for my Inner Circle Newsletter right here and get monthly inspiration delivered straight to your inbox.